Well that was a bit of a mess, wasn’t it? On paper, “Dinosaurs on a Spaceship” should have been the perfect lure to attract new young viewers to Doctor Who. Kids like dinosaurs (to an almost fetishistic degree), and kids also like spaceships, so: Look, kids! Doctor Who is the show that can deliver both, simultaneously! Throw in some historical figures (for educational value), a couple of quirky homicidal robots (for comic relief), a sub-plot about parental approval (for emotional resonance), and a truly dark villain who meets a truly dark end (for seasoning), and you should have the quintessential episode of Who. Unfortunately, in practice, when you throw all those things together—for no particular reason—what you get is an episode that feels designed by committee. If “Dinosaurs on a Spaceship” turns out to be the weakest episode of Series 7, we can count ourselves lucky—parts of it were tremendous fun, and it had just enough substance to save it from total irrelevancy—but it is both overstuffed and undercooked. 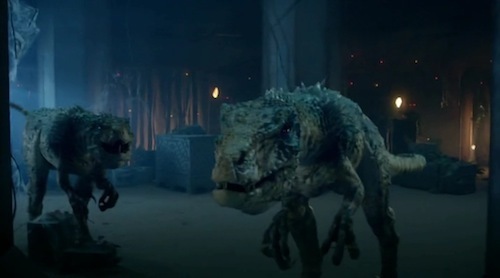 Written by Chris Chibnall (who previously penned Season Three’s “42” and Season Five’s two-parter “The Hungry Earth” and “Cold Blood”), and directed by Saul Metzstein (who is new to Who), “Dinosaurs on a Spaceship” is like an out-of-season Christmas special, long on spectacle and silliness but short on vision and meaning. I hope it did hook some new kids, but, now that they’re here, they deserve far better. Rare for Who, the premise and plot were actually the tightest elements: a Silurian space-ark crammed full of dinosaurs is on a crash course with 24th-century Earth, and due to be blasted out of the sky by the Indian Space Agency unless the Doctor can stop it. The Doctor is finishing up an unseen adventure with Queen Nefertiti (Riann Steele), so he lets her tag along, and stops along the way to pick up a turn-of-the-century big game hunter named Riddell (Rupert Graves), and the Pond family (which accidentally includes Rory’s dad Brian, played by Mark Williams). After some investigation—in which Amy, refreshingly, takes the role of lead detective—it is discovered that a heartless pirate named Solomon (David Bradley) has had his bickering robots (voiced by the comedy team Mitchell and Webb) murder the original Silurian crew in an attempt to steal the rare cargo for himself. This is a perfectly serviceable Who plot, but it takes a deft hand to keep so many elements in play, and neither Chibnall’s script nor Metzstein’s direction are up to the challenge. As it stands, there is simply no reason for Nefertiti, Riddell, or Rory’s dad to be in this story at all: they serve very little purpose in terms of the plot, and even less purpose in emotional or thematic terms. (That there is so little space to do more with Rory’s relationship with his dad felt like a particularly wasted opportunity.) They all seem shoehorned into an already crowded story, as though none of them were present in the first-draft script. 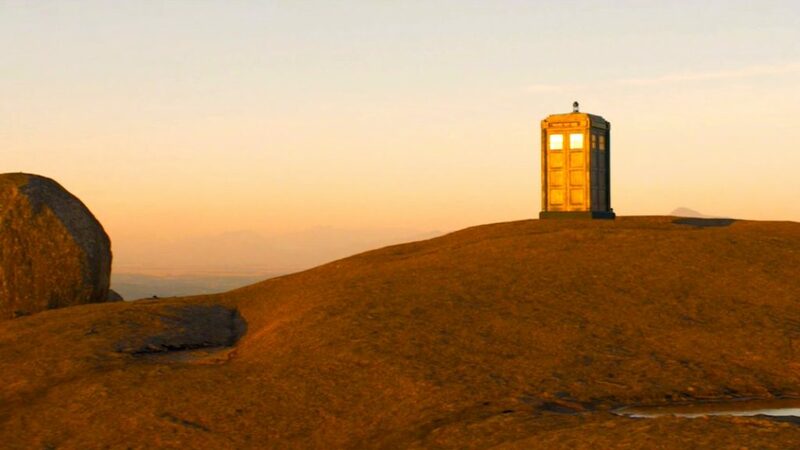 (Compare, for example, the perfect integration and characterization of the Doctor’s posse in last season’s “A Good Man Goes to War,” where each character was beautifully defined and had an important role to play.) 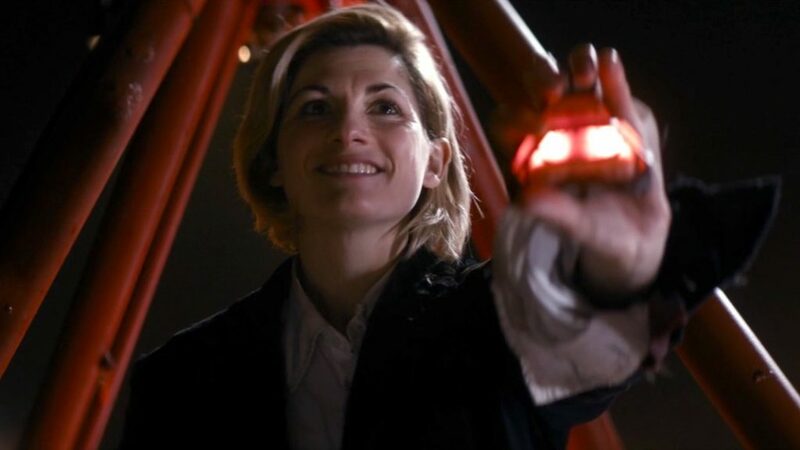 Executive producer Steven Moffat has shown that he likes to end his seasons by bringing back a lot of supporting players from earlier stories, and one suspects that these characters have been clumsily introduced here just so Moffat can use them later. Tonally, too, “Dinosaurs on a Spaceship” is all over the place, which is less a problem of intent than of execution. One of the things I love about Doctor Who is its ability to turn on a dime between comedy and drama, between broad slapstick and smart satire, between the trifling and the tragic. Again, however, it requires a careful screenplay and a nimble director to navigate those hairpin turns successfully, and this thing has all the tonal dexterity of a rampaging triceratops. Here, we go in an instant from comically incompetent robots chasing a golf-ball fetching pet dinosaur to the same robots slaughtering the same friendly beast in a demonstration of pure evil, and it simply doesn’t work: the awkward switch between silliness and tragedy just undermines the impact of both. I suspect there was a thematically rich episode to be found here, and it just somehow fell short in the execution. (For a moment I thought we were heading towards a larger definition of “dinosaurs on a spaceship”—one that could easily include an Egyptian queen, a misogynistic game hunter, a heartless geriatric pirate, and Rory’s trowel-carrying dad—but nothing ever came of it, since the “arcs” these characters traveled were terribly underwritten.) 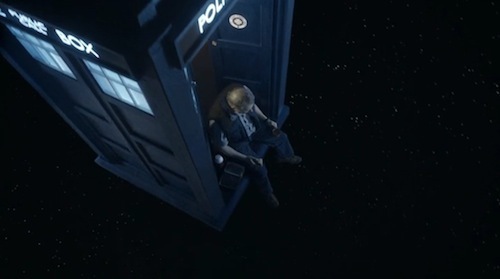 It was a lovely image, for example, to see Brian dangling his legs over the threshold of the TARDIS, high above the Earth, but it didn’t register the way it would have if we’d actually gotten to know this character a little, or seen him have a more meaningful emotional exchange with his son. 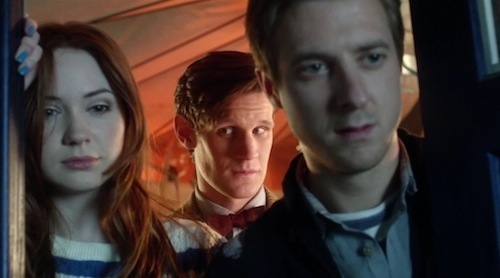 Likewise, the juxtaposition of these relatively thin characters with the soon-to-be-departing Ponds just hinted at some real emotional significance. 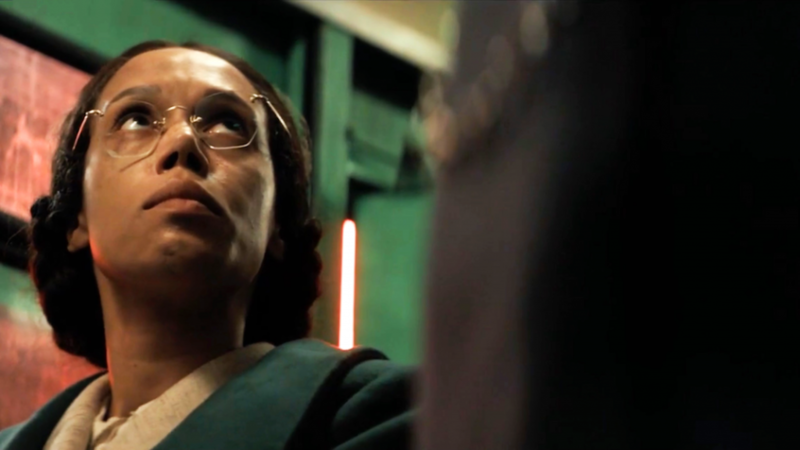 Amy is jealous of new people, and afraid of being replaced, but the Doctor reassures her that there is no comparison: “They’re just people,” he says of Nefertiti and Riddell. 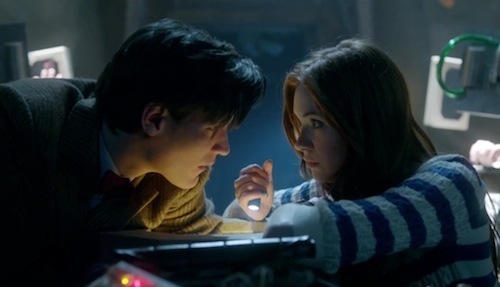 “They’re not Ponds.” The short conversation between the Doctor and Amy—where she accuses him of “weaning” them off him—is one of the few genuine moments the episode has to offer, and builds on the Doctor’s realization last season that he must, reluctantly, do exactly that for Amy and Rory’s own good. “You’ll be there til the end of me,” he tells her. “Or vice versa,” she says, ominously, foreshadowing a darker end that the Doctor had—I thought—already decided to avoid at all costs. I said last week that I suspect the question of whether the Doctor is a figure of peace or war—one of love or hate—is going to be central to this series, so I actually like the move towards a darker interpretation here, but it almost seems like Chibnall and Metzstein miss the significance of it. (The humanizing influence of the Doctor’s companions is a related theme—the fact that he has been traveling without Amy and Rory for a while is a factor here—but the fact that no one even asks the Doctor about what happened to Solomon is a misstep.) If any kids did tune in to Doctor Who for the first time last night, they encountered a main character who kills his enemies without hesitation, without any indication that such behavior might not be acceptible: that’s a problem. Sigh. I’m hard on this show, I know: it’s how I express affection. But I expect a great deal from Doctor Who, and it has proven time and again that it is capable of a great deal more than this. I do recognize that they can’t all be gold, but—as I said earlier—I’ll be pleased if this (occasionally amusing) assemblage of mismatched elements, awkward missteps, and sadly missed opportunities is the worst Season 7 has to offer. I liked this episode quite a bit. Fun, funny, and full of Doctor Who-style wackiness. Sure, it could have been better, but most things could be better. I had no issue with the Doctor killing Solomon. I’d have had more of an issue if he didn’t. Solomon killed thousands of “people”, and in all likelihood it isn’t the first time he’s done something terrible and wouldn’t have been the last. I like that the Doctor usually knows where to draw the line between mercy and punishment (I say “usually,” because I had a problem with Tennant sentencing the Family of Blood to eternal torment; I’m OK with killing mass murderers, but torturing them is unnecessary). I also sometimes read super hero comics, and their typical insistence that the heroes must never ever kill the villains, even when the villains are responsible for literally tens of thousands (or more!) deaths is compeltely absurd. There comes a point where one’s actions invalidate their right to exist, and Solomon certainly fit that bill quite easily. Oh yeah. Speaking as a fan of the classic series, I can’t think of a comparable killing. All the Doctors can be callous: the sixth seemed almost sadistic at times, and the seventh famously tricked the Daleks into destroying Skaro. But Solomon was no threat anymore and could easily have been transported out; this was an actual execution, and it went completely unremarked-on. I can forgive a lot about Who (any Who fan has to), but the one thing that just bugs the hell out of me is how the show keeps chattering on about how cool it is: “Dinosaurs on a spaceship!”, “Rory, I’m piloting a spaceship!”, “I’m worth any two men!” This episode was far from the worst offender in the new series, but for God’s sake I wish everyone would stop attitudinizing.